I was speechless after the output of the photo. She is different from the other women I met, I realized how lucky I am meeting her for the past 2 years. I met her during our summer class, I was curious about her, we never thought that we ended up dating each other. We also never expected that things will turn out like this these days. For a moment right there, we also realized how we should love each other in a “proper” way. We just dont love just like ordinary relationship does, we commit to each other. I chose this photo it is because I literally miss her. Its been almost more than a week I have not met her because we still have some priorities to handle. She is still busy studying on her incoming board exams, I am also busy researching on our project. But sometimes we are able to meet up and spend some time. Everytime I ate my dinner at a fast food restaurant called “Jollibee” alone, I always think about her. The photo took place from SM Seaside Cebu, it was also a nice place the city has to offer. We are on our way watching Deadpool 2, it was fun actually, we had a great dinner also with a couple of friends. It was memorable. Shot from a 50mm lens, with a maximum aperture of 1.8, it is still the best cheap prime lens canon has to offer. I had to play around with the 1/200 – 1/400 just as usual, setting also up the shot mode into burst mode so we will never see her blink. ISO is usually around 200-400 , lets not keep the photo noisy. 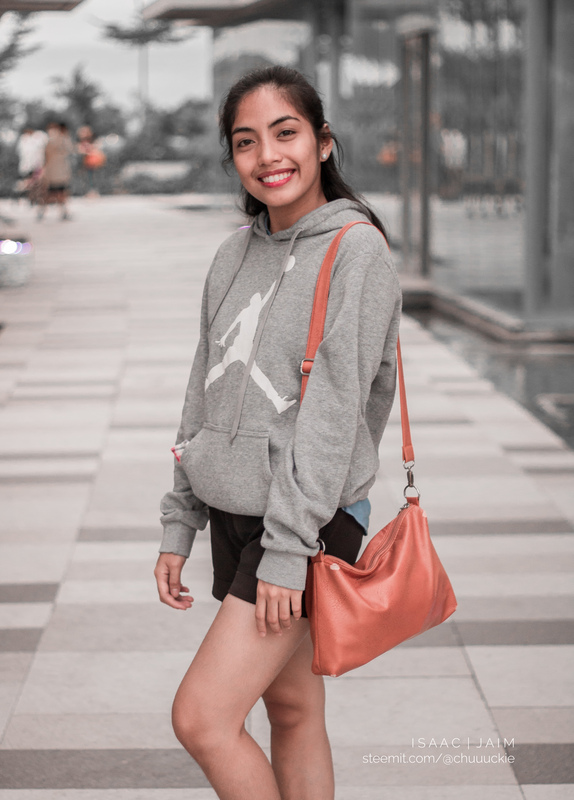 In Adobe Lightroom, I focused on the colors orange and make it look lighter, because Filipinos has a brown complexity skin color, normally I would do this to every client. We should take off the colors green because our subject is her. I also took an advantage on the clarity and the sharpness of the photo because it is less sensitive (lesser ISO). Then we got this photo, I hope you guys like it.